To protect against appropriation, indigenous Maya weavers in Guatemala are organizing for their intellectual property rights to their weavings and designs. 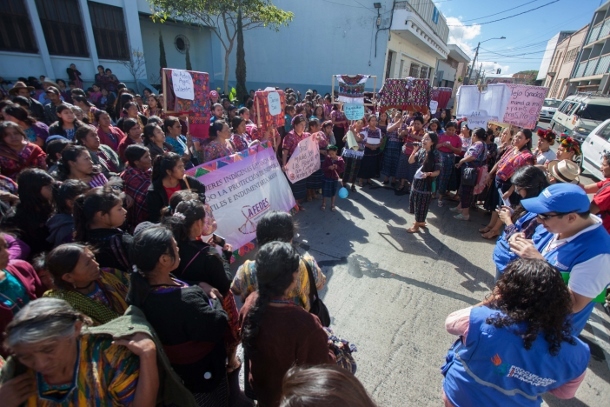 On July 9, Kaqchikel Maya weavers in Guatemala gathered in the town of Santiago Sacatepéquez’s central park to celebrate a small victory in their struggle to protect their weavings from appropriation by transnational companies. In the historic event, the municipality declared that the weavings and designs of the traditional clothing of the town were part of the heritage of the Kaqchikel town, about an hour outside Guatemala City. 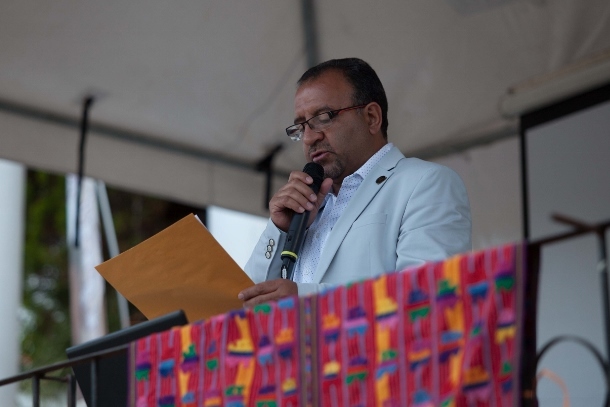 “This is part of our history as residents of Santiago,” declared municipal mayor Juan Carlos Barrios, following the reading of an accord about the recognition of the connection of the weavings to the heritage of their town. The action would require any company that wishes to use weavings from the town to consult the weavers prior to use. This announcement by the municipality comes after years of organizing by the Women’s Association for the Development of Sacatepéquez, or AFEDES, which is based in Santiago Sacatepéquez and is at the forefront of a movement of weavers to protect their weavings. The town of Santiago Sacatepéquez is currently forming the mechanisms to facilitate these consultations of weavers, in accordance with the International Labor Organization’s Convention 169 on the Rights of Indigenous and Tribal Peoples. The declaration by the municipality of Santiago Sacatepéquez is already inspiring other communities to work to protect their designs. One such place where this organizing is occurring is the town of Patzún, in the department of Chimaltenango. Since May 2016, indigenous Maya weavers have organized a campaign to demand the recognition of their intellectual property rights to their weavings and designs. The movement grows out of the concern over the appropriation and the threat of patenting of the designs and weavings. The movement works on the local level, as well as through the national assembly Ruchajixik Ri Qana’ojbäl, which means Guardians of Our Knowledge in the Maya Kaqchikel language. In November 2016, the weavers presented these demands and reforms to the Guatemalan National Congress, where they are slowly advancing. There are six major parts to the reforms, but the key aspects propose a new definition of what are collective intellectual property rights that is in accordance to the organization of the communities of Guatemala, and the recognition of the communities as collective authors of these designs. The women have carried out a number of actions demanding the protection of the weavings. These actions have included protests, community meetings and meetings with congressional officials. They seek to continue to put pressure on the government to protect the weavings from appropriation by companies. Guatemala’s indigenous populations face a constant barrage of racism. Women that continue to use the traditional clothing items face discrimination and harassment across the country. The appropriation of indigenous weavings by companies is driven by the structural racism that exists in Guatemala. In July 2017, the image of a white, blonde woman surrounded by Mayan women, in Look Magazine drew outrage across social media. Xinico points out that in part, this has to do with the devaluation of indigenous designs, which is based on the myth that the weavings and their designs came following the Spanish invasion in 1524. In fact, images of women using the traditional back-strap looms exist in pre-Hispanic glyphs and images pre-dating the Spanish across the country. Indigenous communities are regularly left out of the national discourse, and are viewed as being backwards and anti-progress. As a result of this social exclusion, indigenous communities suffer from the highest levels of extreme poverty, and the ramifications that come with this exclusion, such as child malnutrition, migration and the lack of social services. The racism in Guatemala is also reflected by the use of racist terminologies by companies. 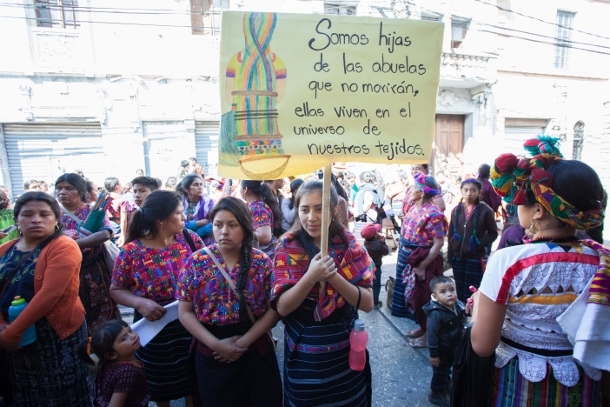 On May 22, representatives from the Guatemalan movement in defense of indigenous weavings along with the Presidential Commission Against Discrimination and Racism presented a complaint to the Public Prosecutors office denouncing the Guatemalan company María Chulu, or Cool María. Activists charge that the name of the company is a common racist slur for indigenous women — stemming from the false belief that all indigenous women are named María — and that they are appropriating and commercializing indigenous weavings without consulting the communities from which the designs come from. These same accusations of racism have been aimed at María’s Bags as well over its name. The intricate designs and symbols that make up the traditional clothing of Mayan communities, and catch the eyes of designers and tourists, are more than just elaborate decoration. The guipiles — the traditional women’s blouses — and other weavings are the transmitters of history and the knowledge of the Maya people. Learning to understand the stories told by these weavings is like learning another language. But the bright, colorful and intricate designs of the Maya weavings are renowned globally. These traditional and sacred items are regularly used to promote tourism in Guatemala, and tourists often seek to return home with a colorful weaving as a souvenir. In tourist centers across the country, women will sell used guipiles in the streets for prices far below the value of the weaving. This demand for weavings has led many companies, both national and transnational, to produce products that utilize the Mayan weavings. Products range from boots that incorporate the weavings to designer purses made with parts of guipiles. The movement has targeted these companies demanding that they cease appropriating the weavings for their products. One company in particular that the movement has denounced is called María’s Bags, which uses Mayan weavings in their high-end designer bags without the consultation of the communities. These products sell for hundreds of dollars, with little going back to the women that produce the weavings. Making this information available to the women that produce the weavings is key in organizing the movement, and making weavers aware of the national situation. “We organized the meetings in order to show the weavers who do not have access to newspapers or social networks how companies are appropriating our weavings, and how they are profiting from our work,” Aspuac said. According to Tzul Tzul, this sharing of information has made it easy to organize the women across the country, and the movement has expanded rapidly as a result. This led to the establishment of a national network of weavers that has brought different communities into the movement. 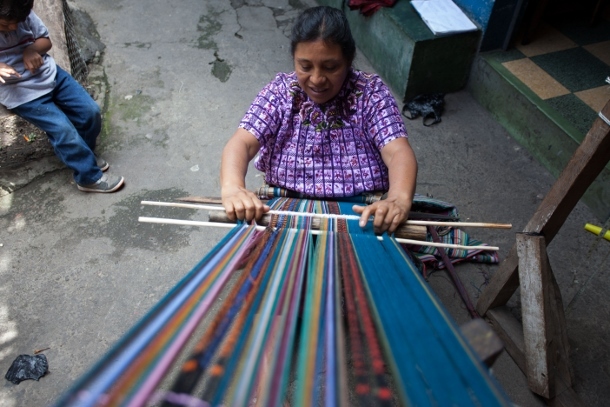 This has been led by women such as Tzul Tzul, who continue the legacy of the weavings in Guatemala. Great article! We are volunteers at a Fair Trade shop, putting together a training for a Bradley University program for retirees. Will be asking Jeff’s permission to use his photos and this story in our presentation. People need to know how their products are sourced so they can make purchases that promote justice, not exploitation. Buy Fair Trade!